For all Android users out there, we have some good news for you today. The popular APEX launcher has just been updated and with it you can now get all of Android Lollipop’s Material Design goodness on your device. 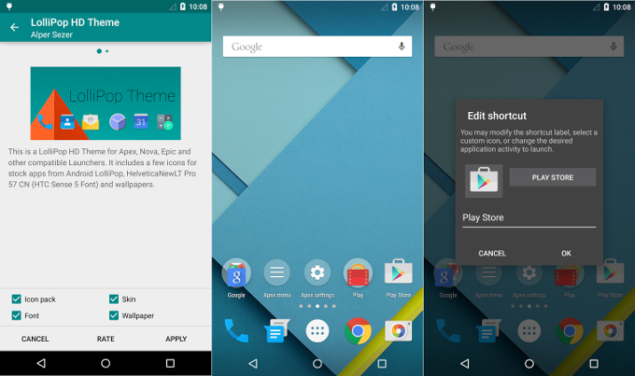 Apex launcher lets you customize your Android device in a variety of ways. These include assigning swipe gestures to dock, putting folders in your app drawer, employ transition animations and add apps to folders. Apex Launcher Updated With Android Lollipop – Get Material Design Along With Your Favorite Customizations. Apex Launcher’s Android Lollipop update comes after another popular Android Launcher, NOVA launchers saw its interface being updated as well. Apex Launcher’s upgrade brings several features on board. These include redesigned Apex action icons, a new scroll speed option, lollipop folder style and animations, new material app icon and more. The complete list of changes can be viewed below. Aside from these changes, Apex launcher also upgrades the Google Now launcher interface with the standard for choosing apps and widgets for your Android device. You can get all of your favorite app, folder and tweak customization with Material Design’s special touch with this update. So head over here and give Apex launcher a try. And let us know in the comments section about what you think and how does the Apex update fare with Android Lollipop improvements brought on board. Cheers.